If Leif Rogers had not had a chance conversation with a cabbie at an airport, his cultural and social life might have been entirely different. But one fateful summer night after he hailed a taxi upon arrival at the Beijing Capital International Airport and the man asked his name, his fate was sealed. "Leif?" said the cabbie. "It sounds just like Lei Feng." 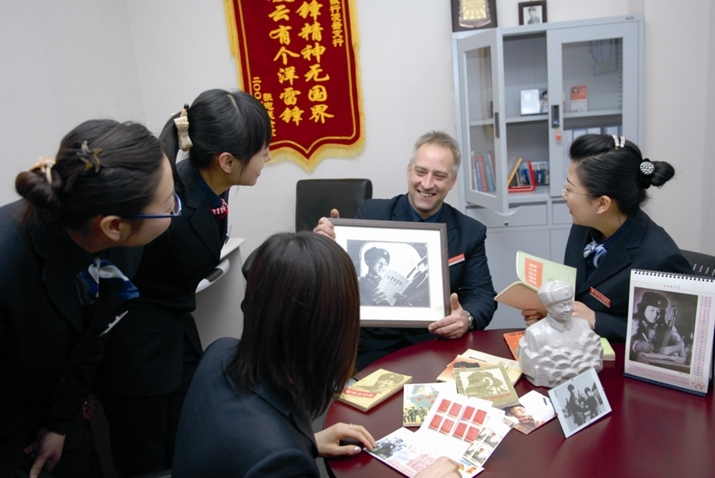 Rogers, then a 34-year-old who had just quit his job as a postal manager in Tacoma, Washington, to teach at the Liaoning University of Technology in Jinzhou, a city in northeast China's Liaoning Province, was intrigued. Who was Lei Feng? His tentative research told him Lei was a young orphan who joined the Chinese People's Liberation Army's transport unit when he was 20. According to Lei's official biography, he died a year later in 1962 after being hit by a falling pole. Despite a lack of medals and heroic deeds, what has made Lei's name live on is the selflessness ascribed to him, putting others' needs before himself and always being ready to serve others. In 1963, a diary written by Lei Feng came to public attention and he began to be regarded as a national icon. A Learn from Comrade Lei Feng campaign was launched and his image began appearing on posters and other memorabilia. As a coincidence, Lei had served the army in Liaoning and came to Jinzhou, which seemed to strengthen the link between him and his American namesake. Soon after this discovery, a student gave Rogers a copy of the diary. "My wife Sun Ning and I read the diary together at night and I would mark the most attractive parts," said Rogers, now 45. In 2007, the couple decided to translate those passages into English. "Actually, it was teamwork and many people were involved, including my wife, my coworkers, and some foreign friends," Rogers said. "And we spent months to discuss the essence with people around us before we started to translate." The difficulty, he explained, was not in the language itself but in the cultural nuance. "The difficulty of translating most of the time is not the language itself but the cultural barriers. Fortunately, at that time there were five English teachers who had great proficiency in English and I could discuss the problems with them. We often spent an entire afternoon debating one single English word for I didn't want to mistranslate the diary and mislead the English readers." Today, the translated excerpts are at the Lei Feng Museum in Fushun, another city in Liaoning. "I regard it as the greatest achievement in my life," Rogers said. "I am [hoping] that some day there will be someone translating the whole diary and it will be published by some press because it is worth reading [by everyone]." While Rogers was working on Excerpts From Lei Feng's Diary, many changes have taken place. He has spent 11 years in Liaoning when he had intended to go back after one year. He has a 7-year-old daughter, has moved to Dalian and also changed his job, becoming the deputy manager in the international business department of the Bank of Jinzhou in Dalian. He has also become a local celebrity with the Chinese media dubbing him the "foreign Lei Feng." But one thing has remained constant: his interest in Lei Feng and his admiration for the man. "I tried every means to search for [more] information on him," Rogers said. "And luckily, when I came to the Bank of Jinzhou, the branch I was put on was the Lei Feng branch, where a deputy manager helped me a lot by providing references and sharing information." To Rogers, Lei Feng was more than a soldier and diarist. He was a role model, someone Rogers' father had taught him to be like when he was a young boy. "My father is a kind man who enjoys helping others," he said, talking about his father, Jim Rogers, who worked for UNICEF in Tanzania. "From the time I was a child, helping others was very important to me and Lei Feng became the person I could continue to follow when I came to China." In 2008, when an earthquake devastated Wenchuan County in Sichuan Province in southwest China, killing over 69,000 people, Rogers took the initiative to raise funds for the survivors, asking expatriates living in Jinzhou to chip in. "Every single foreigner I asked, maybe 48 people at that time, came and donated as much as they could. Even African students who didn't have enough money for [food] donated for the earthquake survivors," he recalled. "We believed it was our duty as foreigners who lived in China to do something for the homeless in Wenchuan, otherwise you didn't belong here." Another initiative revolves around an orphaned young girl who is being raised by her grandparents on a farm. Her dream is to be a dancer, and Rogers has paid for her ballet school lessons for more than six years. "This is what Lei Feng really means for me," he said. 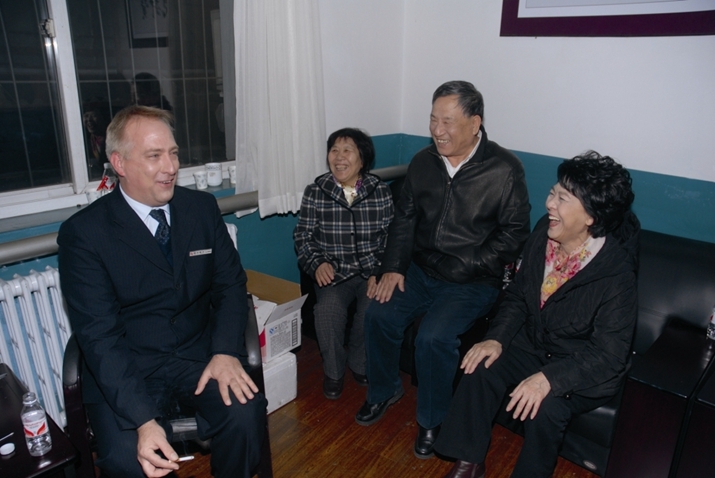 "It is my pleasure to help people around, and it is also the core value of the Lei Feng spirit. What I have done is something I am happy and feel obligated to do." Rogers feels Lei Feng will continue to be relevant even though the global landscape is growing vastly different from the world the young man lived in. "Everybody in the world needs that spirit today. How can you not admire such a wonderful man and those values? Although there are some negative comments in the Western press saying Lei Feng is a totally made-up figure for propaganda who always kept smiling and posing in every poster, so what? Every great person in history, be it Martin Luther King or Nelson Mandela, has been criticized," he said. Rogers thinks Lei Feng will continue to live on and inspire people because the core values he represents—helping others, giving everything one can to anyone in need—are so great that no one can deny their worth. "No matter if you are Chinese, American, African, European or Russian, everybody needs the values. The world will become a much better place if people followed him. It is the significance and universal value of the Lei Feng spirit." • Where Should Museums Draw the Line on Commercialization?